This is one of those spooky stories based on real life; Michael Kuklinski's story has to be true, no one could make it up. 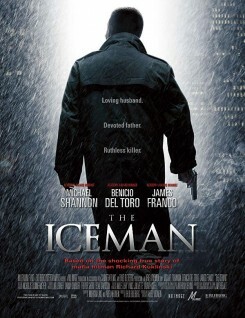 In this R-rated thriller written and directed by Ariel Vromen, we see what shapes a contract killer, what is important to him and whether or not he holds any values. It's awkward for an audience when we find ourselves in a position to be rooting for a cold-blooded killer, and yet we really do NOT want to see his sweet family jeopardized, so we want him to survive. * Michael Shannon ("Premium Rush" and "Boardwalk Empire") is Michael Kuklinski, our contract killer; he is a limited man with limited options: no education, no charm and no skills (other than lethal ones), so he does the best he can with what he has. Shannon is one of the finest actors working today and this difficult role is worthy of him. * Winona Ryder ("The Dilemma") is Deborah Pellicotti, the shy Catholic girl who wouldn't even do any heavy petting until she was married. Her devoted husband respected and adored her. * Chris Evans ("What's Your Number?") is Mr. Freezy, whose ubiquitous ice cream truck moves invisibly through the city. This scraggly haired thug bears NO resemblance to "Captain America" let me tell you! * Ray Liotta ("The Details") is Roy Demeo, a pornographer/crime lord who tested and then exploited the ice water which ran through Kuklinski's veins. Because this takes place over a time span of nearly 20 years, you will get a kick out of the different cars, clothes, hair styles and mustaches that enjoyed passing popularity. Also, it's refreshing to see pagers and pay phones instead of the ever-present cell phones in today's world. If you are anything like me, you will appreciate "the rest of the story" which appears during the final credits. You can't like a film like this, but you can be impressed by it.